Most customers know when a company runs efficiently. Whether or not contractors show up on time or have the right information plays into whether your customers stay with you or move to the competition. Stay ahead of the game with the industry’s best contractor dispatch software, Smart Service. With our intuitive contractor dispatch software, your contractors will know exactly where they should go and when to arrive. Not only will Smart Service help organize your contractors, but this software features compatibility with QuickBooks, adding another layer of efficiency to your company. Providing detailed information on each job and customer, our software will have your team completely ready to take on all their projects throughout the day! Even a busy company must make sure contractors remain as organized and responsive as possible. Any downtime in their day where they have nowhere to go equates to lost productivity and revenue. Our contractor dispatch software will keep your entire team on the same page and help them make the most of every day. Easily find available contractors when new requests come in and notify your team out in the field of schedule or job changes immediately, all with the click of a button. Smart Service contractor dispatch software allows you to eliminate the hassle of rustling through customer folders and wasting time playing phone tag, empowering your team to get to the job faster. Smart Service will also allow you to send job information, work history, customer notes, and GPS directions to your contractors remotely, which will ultimately save time and reduce miscommunication throughout your organization. Not only can contractor dispatch software save you time, it can also save your company money! With Smart Service, your software costs involve a one-time fee for everything you need to streamline your contractor scheduling and dispatch operations. Avoid the pitfalls of high monthly user subscription costs that rise as your team grows. With Smart Service, you own your contractor dispatch software solution. Smart Service software features many additional features and support options to help fit your company’s needs. 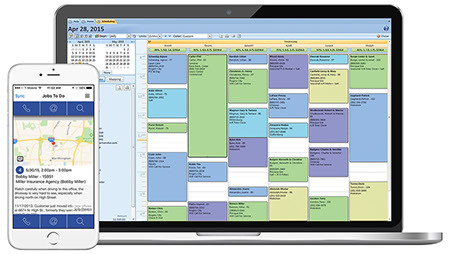 Schedule a demo today to see how Smart Service contractor dispatch software can help your business! Looking for seamless connectivity to your crew while they work in the field? The field service mobile app iFleet works with Smart Service to help streamline dispatching, equipment tracking, work order generation, and invoice generation. iFleet will end the need for handwritten work orders and additional phone calls that ultimately wastes valuable time and money. iFleet allows your contractors to become fully organized and manage their day from their mobile devices. iFleet works hand in hand with Smart Service and QuickBooks to update work order information in real-time and accurately record the customer’s signature once the job gets completed. This helps generate invoices quickly. Give your team the power to get more done with more accuracy. Choose iFleet and Smart Service. Score more jobs and get them done faster with Smart Service contractor dispatch software. Request a free demo today! Run your contractor business the smart way with our tips and tricks!